Like all of her mouthwatering recipes, UVA alumna Stephanie Connock started her growing confectionary business from scratch. Now her gourmet ice cream sandwiches and tarts are delighting taste buds across the region. As temperatures rise at the height of summer in Charlottesville, one University of Virginia alumna is offering a sweet way to cool down. Stephanie Connock is making a splash on the city’s vibrant food scene with Wonderment Bakeshop & Creamery, her gourmet ice cream sandwich and tart business. Connock, a 2010 graduate of the School of Architecture, started experimenting with baking early in life and became known among her friends for her confections. Since then, Connock has expanded her culinary portfolio to include custom delicacies like her s’more ice cream sandwich, a sweet combination of toasted marshmallow ice cream and graham cookies dipped in chocolate. Wonderment customers can also try signature sandwiches like Earl Gray ice cream paired with classic sugar cookies or seasonal options like fresh lemon ice cream between two chewy gingersnap cookies. “Mint chocolate chip on chocolate cookies is also always a favorite. It’s made with fresh mint that I steep in the custard,” she said. The same love of creating that drew Connock to baking also steered her toward architecture when she began looking at colleges. “I considered culinary school, too, but I come from a family of architects and I grew up loving architecture. I also knew that I wanted a four-year degree under my belt and UVA is one of the best schools you can go to,” she said. After graduation, Connock worked as an architect for a local engineering firm for a few years, but kept feeling the pull to take her self-taught baking skills to a professional level. “I have two passions. I did one for a little bit and now I’m pursuing the other,” she explained. 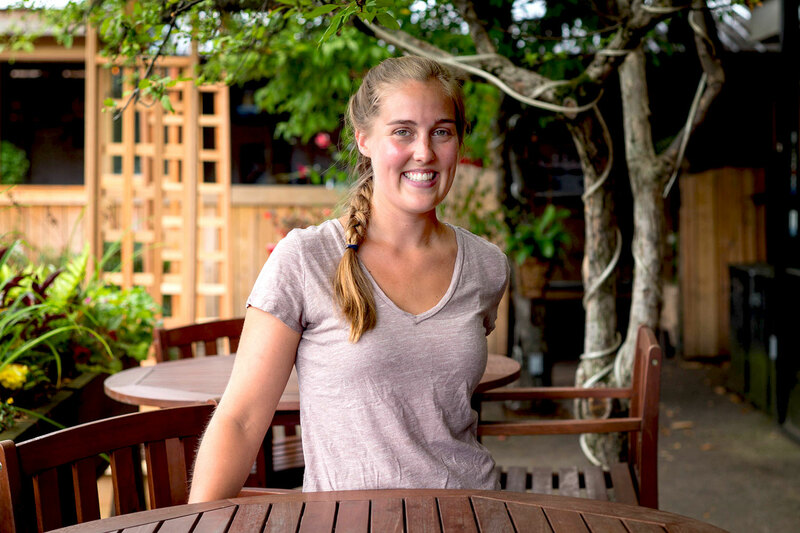 Connock started slow, first gifting herself with an ice cream maker to experiment with and then landing a job with Mudhouse Coffee’s central production kitchen in Crozet. Working there gave her firsthand experience in the food industry. She also learned what it was like to bake in mass quantities, sometimes baking 25 pies or batches of 500 cookies in one day. During that time, Connock started making her own ice cream creations to sell at local farmers markets. “I chose ice cream and tarts – even though they’re kind of random and don’t really seem like they go together – because I love desserts in sandwich form and both of these have that in common,” she said. Her first ice cream sandwich was a Guinness chocolate creation made for St. Patrick’s Day and her first tart was a happy accident on a day when she made too much graham cookie dough. Not wanting to waste the extra dough, Connock stuffed it with cinnamon, brown sugar and a few other spices and threw it all in the oven. The resulting tart was so scrumptious that her fiancé encouraged her to add them to her farmer’s market menu. Since the original cinnamon and sugar tart, she’s added additional flavors like local coffee, cookie butter, birthday cake and dark chocolate. In the below slideshow, Connock begins the first stages of decoration for brown sugar and cinnamon and birthday cake tarts in preparation for sale. As Connock began slowly growing her own business and customer base, she perfected the flavors and sourced the high-quality ingredients that would make her products stand out. Connock now has her own food truck and sells her creations at four local farmers markets throughout the week. She also regularly serves up dessert at weddings and large local festivals. With rising sales, she was able to leave her part-time job in June and work on her business full-time for the first time since she started. Her next goal is to partner with more wholesale customers. Wonderment landed its first wholesale account earlier this year with Devils Backbone Brewery in Nelson County, where diners can order Connock’s creations at the brewery’s outdoor pub area. When she’s pitching potential customers like Devils Backbone, she taps into her experience in the Architecture School. As an entrepreneur in Charlottesville’s competitive food industry, Connock has also learned a lot on the job. She says that knowing when to ask for help is crucial and that new entrepreneurs shouldn’t be afraid to reach out to experienced friends and family or even local industry regulators when they need advice.